This is was we have been waiting for: The Truth about Wacken, this village in the North of Germany, number One place for Heavy Metal pilgrimage, is now revealed – three CDs or more than 215 min playing time, in alphabetical order from A like “admission, stagnant” to Z like “z, impossible to catch some”. This satire also provides important insights, e. g. geographically it should rather be the “Gribbohm Open Air”, and gives hints about the mysterious legends of Uncle Tom and Helga. This is surely no children´s birthday party. But what if such a party was organised like the Wacken Open Air??? You will definitely giggle about insider jokes if you are a W.O.A. Veteran yourself. Moreover, there is this voice of Nogge (he reads the texts of Till Burgwächter and Jan Oidium, creator of e. g. FIRE & STEEL Heavy Metal comics), his dry humour and his Nordic accent, which alone makes me Austrian smile. 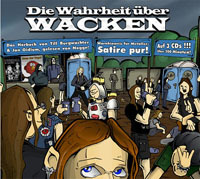 Those CDs will entertain you, when you are stuck in the traffic jam from and/or to Wacken Open Air. Absolutely recommendable!